A few years ago I wouldn't have said this, but mapping is one of the most useful functions of a smartphone. 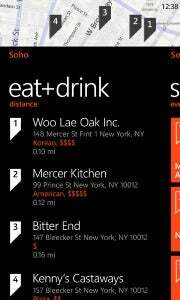 Windows Phone 7 has a Maps app of course, and it includes some unique features worth taking a closer look at for today's 30 Days With Windows Phone 7 post. The Maps app is one of the default live tiles in "Mango", with the mapping capability powered by Bing. At some point early on when I turned the phone on in the first place--either on initial setup, or when I first tapped the Maps app--I got the obligatory request to use my current location data. I approved the request. The Scout function in the Maps app is awesome. I'm not sure what happens when you start Maps if you don't approve the use of your location, but when I start Maps it instantly pinpoints my location and zooms in on me with a circle shading my general area. I can pinch to zoom, and when I get zoomed in close enough it switches to the actual aerial view of the area--I can see my pool and my van parked in the driveway. The Maps app can do directions from Point A to Point B as you would expect. In fact, it even gives verbal instructions for the turn by turn directions, and I like the way it automatically moves the map and stays zoomed in on the part relevant to the current instruction as you progress through the steps. I can also tap on the settings and choose to show current traffic conditions on the map. When it comes to turn by turn directions, though, the Maps app is missing one key thing--the ability to automatically track my location and provide verbal cues and instructions as I go. Basically, at each step in the directions I have to tap the screen again to get the next instruction. But, it doesn't warn me when my turn is coming up, or recalculate the directions if I miss a turn. The Maps app has an awesome feature, though, that makes it ideal for a smartphone mapping app. On the bottom row of icons is one that looks like a house and a couple buildings next to each other called "Scout". When you tap on the Scout button, the "Mango" Maps app helps you explore--or scout out--the surrounding area. There is a tab called "Eat + Drink", "See + Do", "Shop" and "Highlights". Each restaurant, site, or attraction is numbered, and as I swipe from tab to tab the numbers are positioned on the map so I can see where they are in proximity to my location. I can tap on any of the listed entries for more details. Under "See + Do", I tapped on Main Event--an area arcade and laser tag, sort of place. It displays the address and phone number. I can tap the address to zoom in on the location on the map, or tap the phone number to call them up. It also provides a link to tap to get directions from my current location, and a link to the establishment's website. I can also swipe to switch to the "Reviews" tab where the location is given a rating from one to five starts, and includes comments from others who have visited Main Event. There is also an "Apps" tab, which I assume would have any custom apps for the given restaurant or attraction. Mine just lists some app for monitoring traffic conditions. The Scout function is pretty cool even in my own neighborhood. But, when I am out of my element, or traveling, this function could be my favorite thing in all of Windows Phone 7. How awesome is it to just tap the Scout button to figure out what restaurants are available nearby, or what sites and attractions are available to visit? The Maps app is awesome. If you have followed along with the 30 Days With Windows Phone 7 series, though, you know that I bought the Garmin StreetPilot app as well. I will gladly switch to the "Mango" Maps app when I get where I am going, but when I am driving I want my turn by turn navigation to be automatic. If Microsoft manages to leverage its partnership with Nokia to incorporate some Navteq mapping, maybe the turn by turn navigation will improve and I won't need the Garmin app.